My children love to snuggle up with their blankets and my four year old son has a “blankie”. His dad has been trying to convince him that big boys don’t have a blankie and it has been a losing battle. CuddleUppets is a great solution because it is a blanket that is also a puppet. 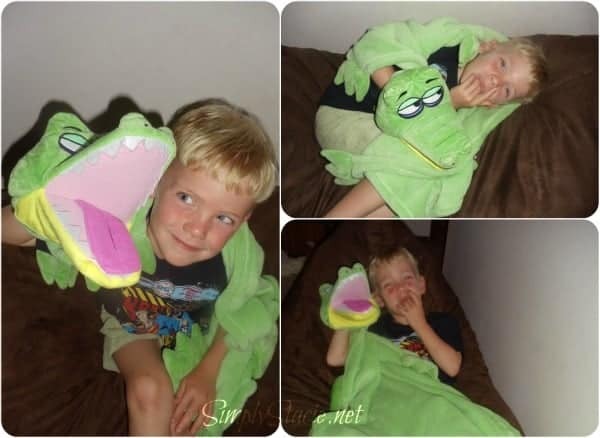 Kids can cuddle up with a supper soft blanket and also enjoy playing with the cute critter puppet. CuddleUppets™ are the popular As Seen on TV blankets that kids of all ages are sure to think are fantastic. The moment that my little guy laid on the green Crocodile CuddleUppets he was “in love”. We are heading out on our summer vacation road trip for three weeks and my husband had just informed my tearful son that he couldn’t bring his blankie. My wise son decided to negotiate with my husband and convinced him to let him take his “big boy” CuddleUppets crocodile instead of his baby blankie. CuddleUppets will be perfect for our road trip so that he can feel comfortable with a beloved favorite while napping or sleeping in unfamiliar places. There are lots of fun CuddleUppets™ to choose from including Pink Poodle, Purple Monkey, Yellow Puppy, Blue Elephant, Brown Bear and of course the “ferocious” Green Crocodile. My five year old daughter and seven year old son think that CuddleUppets™ are “really neat” and would love one too……..I just may surprise them all with their favorite character before heading off on our summer trip! CuddleUppets™ are available online for only $19.99 plus shipping and handling. Additional CuddleUppets are only $16.99 making it more affordable to stock up on these cuddly blanket puppets! You are invited to visit CuddleUppets™ to purchase your favorite today!